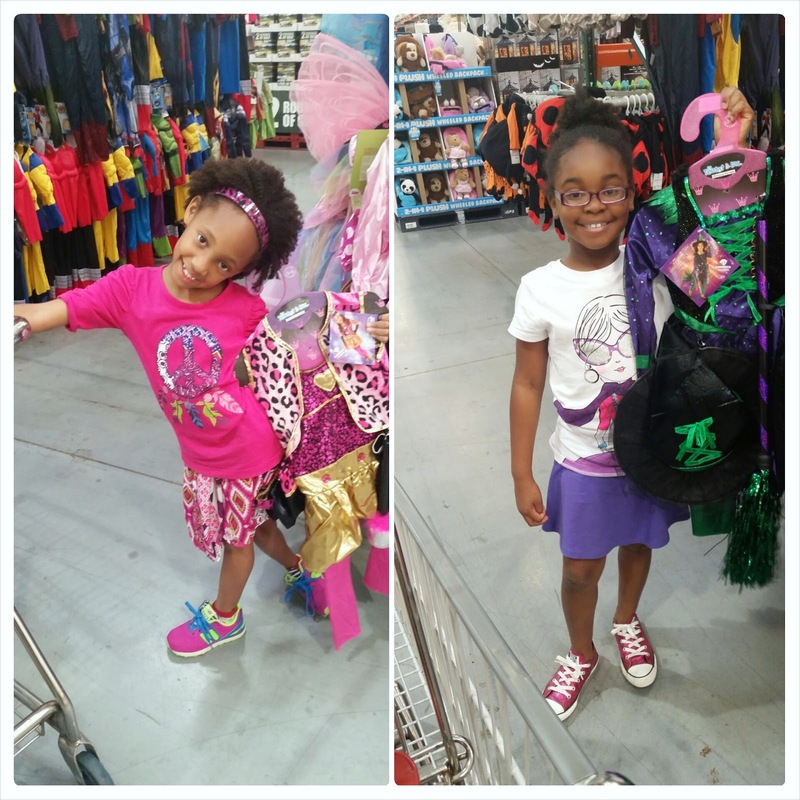 I recently finished purchasing all of my girls school supplies and Fall clothes for back to school. I thought my big shopping days were over for about a month so now I can recuperate. But then I made the trip to Kroger and Costco, and what do I see.....all of their Halloween costumes, Halloween party supplies, and bags of Halloween candy are already out on display! Seriously? Can my wallet ever catch a break? Next thing you know it Christmas decor and gifts will be on the shelves! Each year, I always waited until the last minute to buy my girl's costumes because money was tight, or Halloween would just slip my mind since I'm always busy working. And by waiting until the last minute for prices to drop, my girls would end up with the leftovers and it would break my heart each time seeing them not find what they actually want. Did you know there is a website that offers great deals on Kid's Halloween costumes and has the lowest prices guaranteed? Also, they have every costume that you could think of! Wondering what website I'm speaking of? It is Costumes4Less.com! They have the largest selection of costumes on the plant! But they're more than just costumes for Halloween, you can get costumes for any occasions like Christmas costumes, pet costumes, adult costumes, mascot costumes, and more! You want to know what will be the Top Kid's Halloween Costumes this year? So if your wallet is a bit bare from all the back to school shopping, visit Costumes4Less.com. Also it helps you avoid all those scary crowds. Have a Happy Halloween! What will you and your children be dressing up for Halloween? My grands, all boys, always dress as a super hero, it seems and I've ordered from that company before! I always buy their Halloween costumes. It's so much fun! You may have used Costumes4less.com before since it is a very popular website. I was just telling S it was time to start thinking about what she wanted to dress up as for Halloween. At the time she told me Belle, but that's what she was last year. I'll have to see if she changes her mind and then check out the website! LOL that's funny Paris because my girls always want to be the same thing each year. Oh boy. I am not even done with back to school yet. Is it time for Halloween shopping already? I know my oldest is going to want to be Spiderman. I am not sure what the younger two and myself will be yet though. I know right Victoria? Halloween is coming quick and the holidays is just around the corner. My pocketbook is going to be blowing out dust by the end of the year. My girls wants to be some kind of princess but I hope they change their mind since they seem to be one each year. Thank you for sharing these! I am already hunting for my son's first Halloween costume! Awww he is going to be so cute Logan! My girls were pumpkins for their first Halloween. I will be checking them out for sure! I haven't been to a Halloween Party in years. Each year I say that I want to participate but flake out at the last minute. It's good to know there are websites to help with costume selections. This will also save on duplicate outfits. One year I saw 1000 Spidermen. Oh my.. I haven't been to a Halloween party at all since I never dress up. And LOL at 1000 Spidermen running around! I remember when my girls use to watch Bubble Guppies and Yo Gabba Gabba, their tunes would be so catchy and I would find myself singing along with the show too. I love Fall as well! Time to start dusting off my boots and cardigans. And if you look way way up - you will see the Christmas trees..oh Thanksgiving...they don't even sell those decorations anymore - SMH! ROTFLMAO!!! I hardly ever see Thanksgiving decorations anymore. Stores skips that holiday and head straight for Christmas!